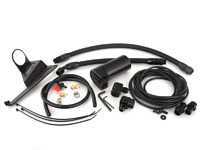 The Turner Motorsport A/N catch can kit is the ultimate in blowby protection. 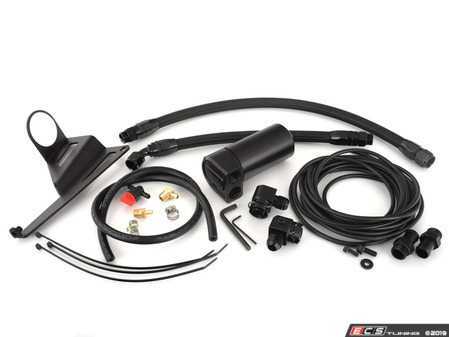 This kit features a Turner catch can, perfect length A/N lines, and billet PCV adapters for seamless installation. Not only will this system protect your S54 from blowby, but it also looks excellent in the engine bay of your E46 M3. The benefit of having a catch can on your vehicle has to do with how much oil vapor is being recirculated back into the engines intake system to be burned. This recycling process is used mostly for emission purpose to keep these harmful vapors out of the atmosphere. Though it is better for the environment its typically not much better for you engine since the burnt oil will slowly become carbon build up & sludge through vacuum hoses, PCV system, and valves. The catch can assists in separating oil and water vapor from the crank vent system. The Turner catch can features a 4 chamber, baffled design for the best efficiency when it comes to the separation process and engineered to create multiple changes in the direction of airflow within the separator to cause oil droplets to fall out of suspension before exiting the catch can. This catch can was also engineered for convenience featuring a dipstick to check the fill level and comes complete with a valved drain system. This kit includes a passenger side mounting bracket design specifically for the S54 engine bay with A/N lines for a clean install with no creative modification required. Please select your model - the A/N lines are different depending on the year of your vehicle.